OCEANSIDE — With a brush and some paint, downtown Oceanside may slowly become an artist’s paradise. Over the next several weeks, MainStreet Oceanside, the downtown business organization, is putting out a call for artists to join the Oceanside Mural Initiative, according to MainStreet Oceanside Program Manager Gumaro Escarcega. 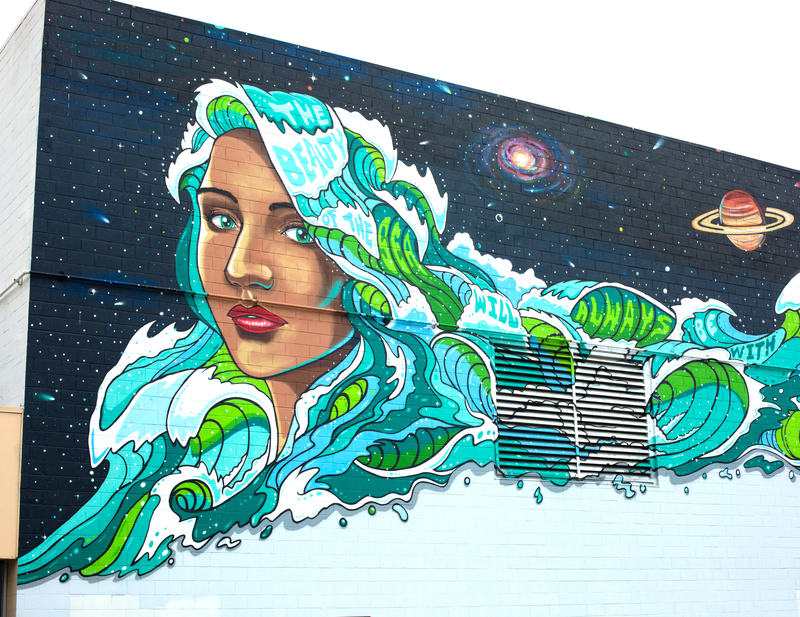 The program, launched in 2016, has already made waves with Skye Walker’s “The Beauty of the Sea Will Always Be with Me,” mural painted on the wall of the Star Theater in 2017. The call for artists is not limited to Oceanside residents, Escarcega said. Now, Escarcega is pushing forward with MainStreet’s second project, which will be a wrap-around concept covering parts of the west and north walls at Northern Pine Brewing and That Boy Good, 326 N. Horne St. However, money is an obstacle, which is why Escarcega and brewery co-founder Anne Ortega are organizing several fundraisers. Escarcega said one goal of the program is to pay the artists, which is why he set up a GoFundMe page and has several grassroots donation drives scheduled. The first project cost about $6,000, while the others are tagged at about $10,000 each. MainStreet Oceanside will cover 50 percent, while Escarcega must raise the rest. The structure of the program has Escarcega as the point man as well as a panel representing the property or business owner. From there, they deliver a call to artists and receive renditions of the proposals. Then the panel selects the top three, and the public chooses the winner. For example, during the first mural, more than 1,600 people voted through social media and Main Street Oceanside’s website. Once the winner is declared, they have one month to put up the mural. And for Ortega, once she heard about the first mural, she and her husband jumped in with both feet. She is a big supporter of public art, and she and Escarcega noted how efforts in Carlsbad and San Diego have drawn more attention and tours of those murals. In addition, Escarcega said he learned in his meetings with similar organizations in San Diego and La Jolla, the murals reduce graffiti. The initiative, Escarcega said, is planned over the next 10 years with one mural painted each year. However, if enough money is raised and donated, those timelines would be pushed up and several projects could begin in the same year. Each property owner or business, meanwhile, must commit to having the mural up for five years. Ortega said it is worth the commitment and adds value to those locations in the form of public tours, tourists walking and stopping inside and a general beautification of downtown. My name is Joi Cole. I am an abstract acrylic painter… How do I sign up ?!!! ?